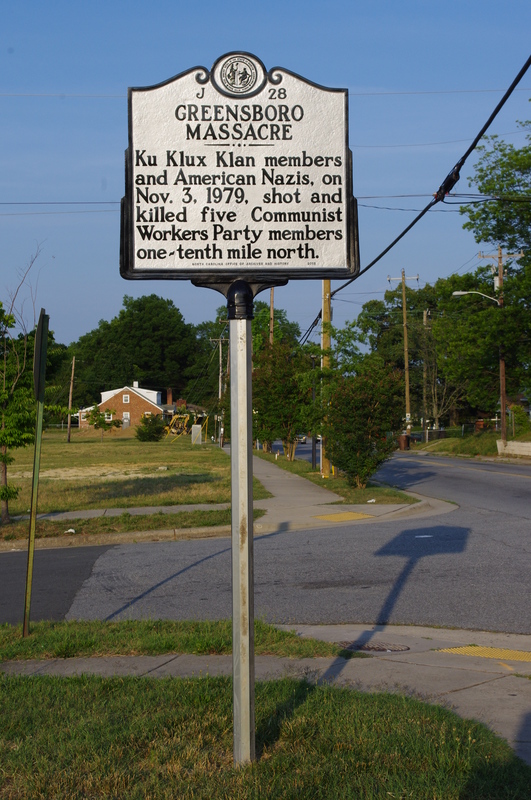 Ku Klux Klan members and American Nazis, on Nov. 3, 1979, shot and killed five Communist Workers Party members one-tenth mile north. 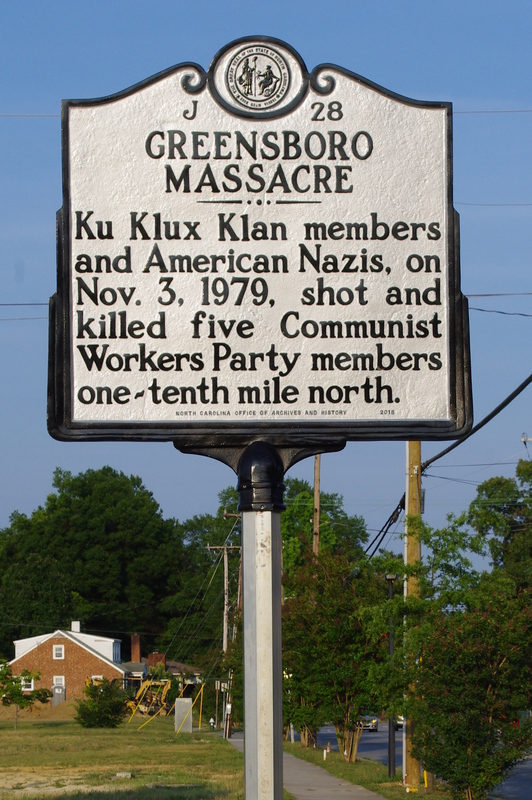 On November 3, 1979, five people were killed and ten injured in an event known for some time as the Klan/Nazi Shooting and more recently as the Greensboro Massacre. The encounter took place in Morningside Homes, a public housing complex, at Carver and Everitt Streets (the houses have since been rebuilt and the intersection no longer exists). It occurred after articles appeared in North Carolina newspapers about a planned “Death to the Klan” march. Members of the Communist Workers Party held news conferences and distributed flyers. Word spread to members of the Ku Klux Klan and American Nazis in other parts of the state and they arrived with guns in their trunks. Events unfolded in rapid order, with shots fired by both sides, and television crews were present to record the violence. Police arrived after the shooting was over. Killed were Sandi Smith, Dr. Jim Waller, Bill Sampson, Cesar Cauce, and Dr. Michael Nathan. Jurors acquitted those charged, who asserted self defense, in a state trial in 1980 and in a federal trial in 1984. A civil suit in 1985 resulted in a finding for the family of Dr. Nathan and a payment by the city of $351,000. Memory of the event lingers in Greensboro and across the nation. In a 2006 report the Greensboro Truth and Reconciliation Commission recommended that “a public monument should be built on the site of the shootings to honor those killed and wounded on November 3, 1979.” To this date no such monument has been constructed. The victims of the shooting are buried in southeast Greensboro. The reverse side of their memorial in Maplewood Cemetery recounts the history of the CWP and the violence.